PWI ranked him No. 111 of the 500 best singles wrestlers during the "PWI Years" in 2003. WWC World Tag Team Championship (1 time) – with Carlos Colón, Sr.
↑ 1.0 1.1 1.2 1.3 1.4 "Wrestler Profiles: Pedro Morales". Online World of Wrestling. สืบค้นเมื่อ October 2, 2007. 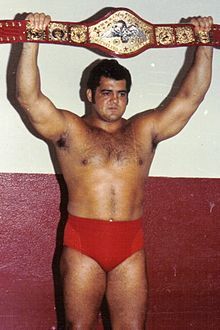 ↑ 2.0 2.1 2.2 "WWE Hall of Fame: Pedro Morales". WWE. Archived from the original on 2007-07-17. สืบค้นเมื่อ 2007-09-21. ↑ 3.0 3.1 3.2 Steven Slagle (2002). "Hall of Fame: Pedro Morales". The Ring Chronicle. Archived from the original on May 26, 2011. สืบค้นเมื่อ 2013-03-11. ↑ "Morales' second Intercontinental reign". WWE. Archived from the original on 2007-09-03. สืบค้นเมื่อ 2007-10-01. ↑ "Ivan Koloff's WWE Championship reign". WWE. Archived from the original on 2005-07-15. สืบค้นเมื่อ 2007-10-01. Pedro Morales [defeated] Ivan Koloff for the [WWF] Championship...Morales would also go on to become the first Triple Crown winner [upon winning] the Intercontinental Championship and World Tag Team Championship. ↑ 6.00 6.01 6.02 6.03 6.04 6.05 6.06 6.07 6.08 6.09 6.10 6.11 6.12 6.13 6.14 Royal Duncan & Gary Will (2000). Wrestling Title Histories. Archeus Communications. ISBN 0-9698161-5-4. ↑ "Wrestler of the Year". Wrestling Information Archive. Archived from the original on 2007-02-10. สืบค้นเมื่อ 2007-10-01. ↑ "Pro Wrestling Illustrated's Top 500 Wrestlers of the PWI Years". Wrestling Information Archive. Archived from the original on June 16, 2008. สืบค้นเมื่อ 2007-10-01. ↑ Hoops, Brian (February 10, 2017). "DAILY PRO WRESTLING HISTORY (02/10): MASA SAITO WINS AWA GOLD AT THE TOKYO DOME". Wrestling Observer Figure Four Online. สืบค้นเมื่อ February 10, 2017.